TEG DAINTY Presents in association with Showtime Management and Moonshadow Aus Pty, have today announced new dates for British singer-songwriting legend and Rock and Roll Hall of Fame inductee, Yusuf / Cat Stevens – who will tour South Africa for the first time this November. The three-city 2017 concert tour commences in Johannesburg on the new date of Wednesday, 8 November 2017 at the TicketPro Dome, before moving to the Kirstenbosch Botanical Garden in Cape Town on Saturday, 11 November 2017. The tour will finish on Wednesday 15 November 2017 at Durban’s ICC Arena. Paul Dainty, President and CEO of TEG DAINTY said today “Yusuf / Cat Stevens is one of music’s greatest legends with the greatest line up of hits, his live shows are renowned and critically acclaimed. 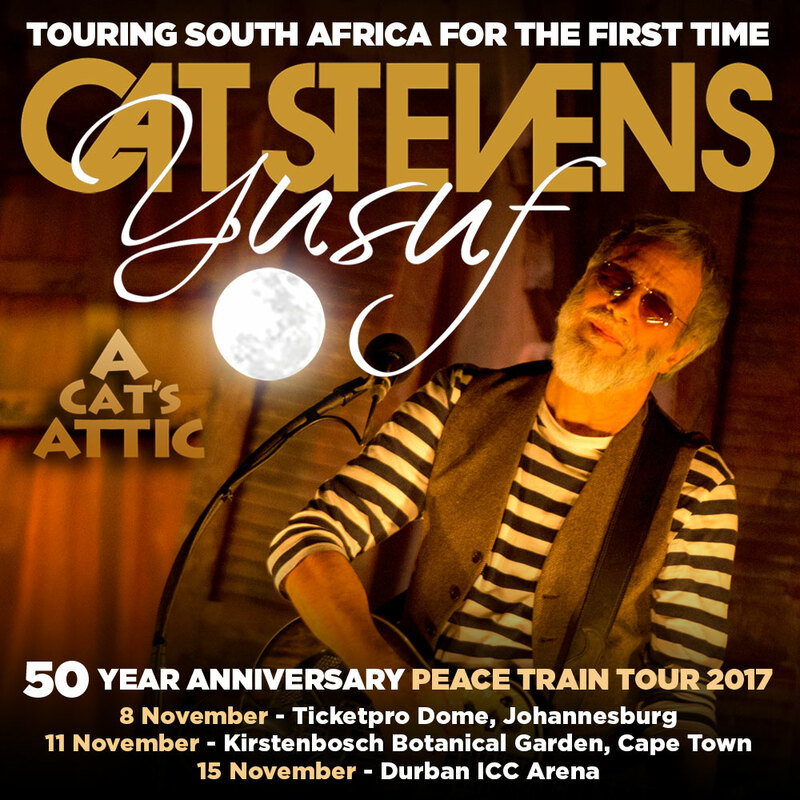 I look forward to bringing Yusuf / Cat Stevens to South Africa for his first ever tour”. Show tickets are only available at Computicket and Webtickets (Kirstenbosch Botanical Garden). Tickets on sale this Monday August 7 at 9am. The “Peace Train Tour” commemorates the 50th Anniversary of his first major hit single and debut album Matthew & Son released in 1967. It will offer local fans an unmissable concert event, including hits such as Wild World, Moonshadow, Father and Son, Peace Train and Morning Has Broken, as well as songs from his new album. Johannesburg and Durban: Computicket by calling 0861 915 8000, visit www.computicket.com or visit your nearest Computicket service centre.